I had the opportunity this past Sunday to provide tabla accompaniment to Smt Pratima Shankar, who is an accomplished classical vocalist from Delhi. 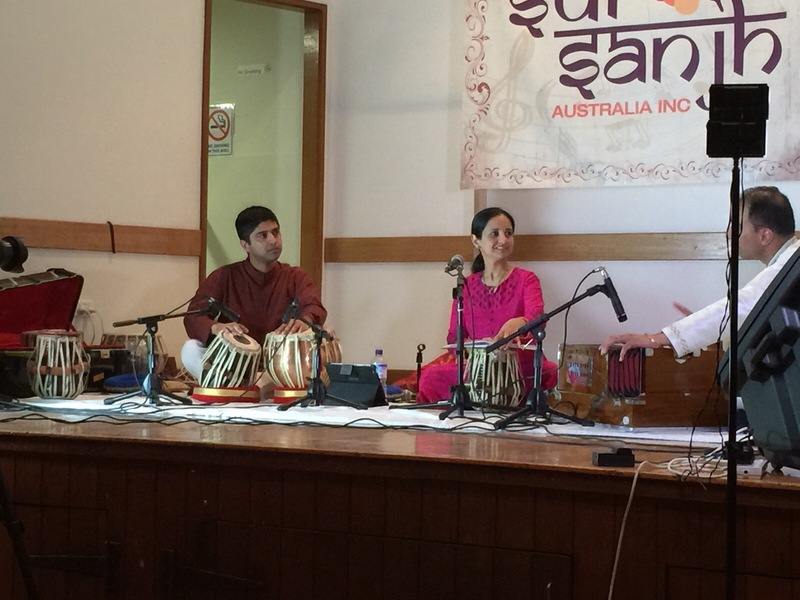 The performance was a part of Sur Sanjh, which is a musical event held every two months or so in the western suburbs of Melbourne. The organiser is a good friend of ours and a very accomplished musician named Bikram Malhar. He can be seen providing harmonium accompaniment in the picture below with Pratimaji and myself. Pratimaji sang two compositions in Raga Gaud Sarang which I believe is an afternoon raga in the Sarang family, which includes ragas such as Brindavani Sarang. It was a “chhota khayal” which is usually the latter part of a traditional khayal performance featuring mid-tempo or fast-tempo rhythmic accompaniment. There was not enough time allotted to perform a “bada khayal” which is a much slower tempo part of the performance. For me, it was my first time to accompany a classical vocalist. Although Pratima and I had done a couple of practices beforehand, I still found it a bit challenging on the stage. Getting a feel for the underlying rhythm in khayal vocal is more difficult than with sitar or sarod, I find, as there is no underlying strumming of chikari strings to indicate the tempo. It is in general a more subtle and nuanced art form compared to the instrumentals, which is probably why vocal has traditionally been considered the highest form of musical expression in Indian classical music. Paying close attention to the “sur” or tuning of the tabla is also of paramount importance in a vocal performance as an out of tune tabla can throw off the singer. Despite the lack of opportunity to perform much (if any) solo material in a vocal performance, it is still quite challenging as you as the tabla player have to pay close attention to what is going on at all times. I’m looking forward to doing more practice with Pratimaji in the future to sharpen my abilities to provide tabla accompaniment for khayal vocal, and hope there will be more opportunities to perform with her in the future. A great write-up on the intricacies of tabla accompaniment. Good commentary on the nuances of instrumental vs vocal accompaniment. More on this in my next post.